Just this morning, Motorola sent over its brand new Moto E, a $149 (off-contract) Android smartphone that wants to give budget-conscious shoppers a device choice with fewer compromises. We’ve spent the AM putting the Moto E to the test, and based on initial impressions, it’s a pretty capable device, with a nice design that offers a lot in the way of customization and attention to detail. The quad-core processor seems to handle Lollipop’s various UI animations pretty well, though the low-resolution display isn’t easy to get used to if you’re accustomed to Retina or similar type screens. And the 5 megapixel camera, though improved from the original thanks to AF, still isn’t going to be winning any photo competitions, especially in low-light or indoor shooting situations. But taking into account this is a $150 device, there’s a lot to recommend it. The virtues of the Moto E include the industrial design, which is mostly no-nonsense, but which also feels incredibly solid. It’s a little heavy and thick compared to flagships, but that’s actually a virtue if you’re looking for something that feels substantial in the hand. And the texturing on the replaceable edge, plus the buttons and rear camera bezel, all contribute to make it feel more premium than its price tag would indicate. 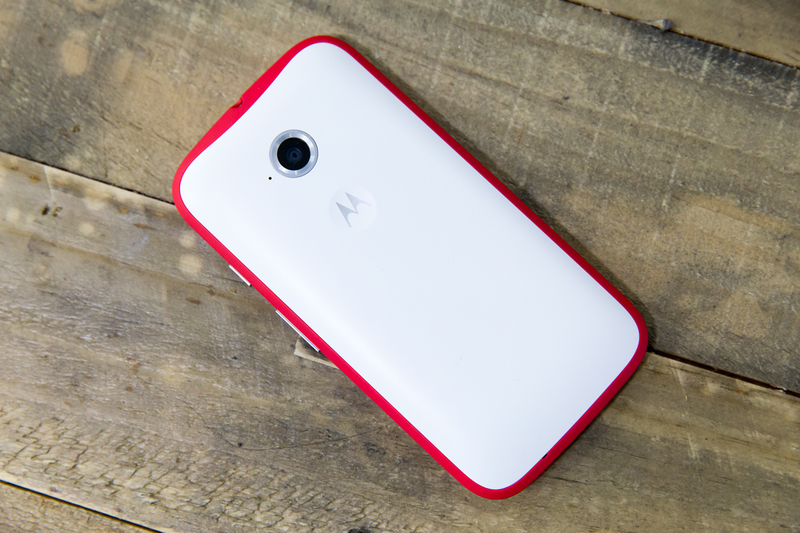 Lollipop is also always grand, and so far performs well on the Qualcomm quad-core processor in the Moto E. In terms of software, Motorola has gone with its trademark light touch approach, which means you get basically stock Android, plus some new practical features brought over from the Moto X. These include the double flip of the wrist to trigger the camera from anywhere, which is useful, if a little dangerous-feeling, and the ambient display awakening if the phone detect nearby motion. I’m also surprised how much I enjoy swapping out the bezels with different color options: It’s a small tweak, but Motorola has made it very easy to remove and replace these, which means the barrier to actually changing up your device with fun personalization options is lower. It doesn’t seem like much, but it’s something you won’t find even on more expensive devices. Overall, the Moto E looks like a very capable successor to the original, and an extremely good bargain at this price point. We’ll be doing more testing to back up that first impression, however, so stay tuned for a full review to come.